First, custom fishing rod building produces rods created to your specifications, unlike the thousands of rods that are sold off the shelf. In simplest terms, this equates to "freedom of choice" in your fishing rod design … to meet your requirements. The factors that classify a "custom fishing rod" as truly “customized” is the level of detail, care, attention, and most importantly, the handcrafting and hand-tuning to ensure seamless design interaction between individual fishing rod components for your "one-of-a-kind" fishing rod. Make no mistake, what you've fished in the past (i.e., an "off-the-shelf" rod) and a custom fishing rod ... there is no comparison. Do you really think the pro-anglers are fishing the Classic and winning tournaments with OTS rods? Or that other sportsmen/women use OTS sporting equipment in their professions? No way. Whether a professional angler or professional sportsman/woman, you can rest assured the gear and equipment they’re using to compete at the highest levels of competition is not only specialized, but handcrafted, tuned, custom-fit, balanced, and leveraging the very besting premium components that technology can muster. So, that fishing rod might “look” like an OTS fishing rod, but it’s the product of custom fishing rod building and has been crafted by a custom builder to ensure maximum performance and therefore, that fishing rod is a custom fishing rod handcrafted to fit precise, specific, and extreme angling requirements. True, there are not too many anglers who own a custom fishing rod. There’s a simple reason for this. Custom fishing rod building is a one-at-a-time process. Custom made fishing rods are not mass produced and therefore not available to the public in general or at least not to the point that an angler has the opportunity to make a retail purchase at their local tackle or fishing store. However, with the advent of improved technologies, and the availability to meet a myriad of new potential customers via the Internet, many more anglers have custom fishing rod building within reach and are leveraging the opportunity to design and purchase custom fishing rods. Production rods are typically designed and made for the average person with average skills and are manufactured using average components, all of which will provide reasonable performance. However, those who demand more from their fishing rods turn to custom fishing rod building to acquire the tool they require for the style of fishing they prefer and the performance they expect. 1. Pick up the exact two casting rods off-the-shelf, put the same reel on each of the two rods, and then place them into their respective “optimum” parabolic shapes by pulling the rod tips using the line. Now, note where the fishing line touches the blank on each rod and note the tip twist of each rod. If the rods were the same, the line will touch at the same points on each of their respective rods and the twist (or hopefully, lack of twist) would be equivalent as well. 2. Now cast the rods … distance and accuracy should be equivalent between the two rods. In every case, this will never happen with an “off-the-shelf” rod as every rod is manufactured using guide placements in the exact same spot of every blank being constructed in a similar rod. Currently, I know of no company that mass produces fishing rods and takes the time to individually tune every guide under both a static and dynamic load prior to wrapping guides as is found in custom fishing rod building. These are both required to achieve optimum guide placement and ultimately rod performance. Not to mention a few critical requirements that are never performed before guide placement. Such as rod splining, rod balancing of the handle system, rod re-balancing for guide systems, etc. Don’t get me wrong, there are companies that take the time to complete a step or two of the overall “right” process but there are none that perform all of the required steps. In custom fishing rod building a professional custom rod builder strives to ensure that rod component integration is accomplished to elicit the very best performance from each fishing rod. If a customer takes the time to identify and choose rod components that complement their fishing style, technique, and specifications, then you can rest assured that the custom rod builder works to ensure their finished custom rod performs the way they expected it to, and then some. Although it is true that most rod manufacturers today do produce some great high quality rods, you simply cannot ignore the fact that they are made with the average angler in mind. Do you know who the average angler is? I sure don't! Taking a look at all of my fishing friends, not one of us is similar in size, casting style, or grip preference to name just a few variables. Yet, the rod manufacturers would want us to believe that their rods will match all of us perfectly. When you commit to custom fishing rod building and decide to fish a custom built rod you are adding another dimension to your fishing. There is nothing quite like the thrill of making perfect casts, hooking and landing a fish on a rod that has been custom built for you. You don't have to depend upon whether some individual was having a good day at the factory or not when they wrapped the guides on your rod or if they chose the best pieces of cork for the rod grip. As well, you know that time was taken to ensure that the guides were placed on the rod for optimum performance and that the best quality components were used. Another great reason for choosing a custom built rod is that you have so much choice as to what components you want on your rod! Perhaps you have found the rod that has the action that is perfect for you, but you're not satisfied with the type of guides, the quality of cork, the thread wraps or perhaps you want to move up to a better quality reel seat. You don't have this type of choice unless you turn to custom fishing rod building and get a custom rod. The overall properties of these “Off-The-Shelf (OTS)” fishing rods created by major fishing rod manufacturers are extremely dependent on what rod components are attached to the rod blank, and more importantly the process by which those components are attached to the rod blank. Thus, the number, type, and placement of guides; the wrapping; and the choice and placement of handle material/components totally affect the end use of the intended fishing rod, but more importantly … the overall quality and performance of the fishing rod because not all fishing rods are created equal. For the most part, custom rod builders are and have been the foundation of the fishing rod industry for many years. However, it is important to note that both the custom rod builders and the major fishing rod manufacturers are reliant upon each other to some degree – i.e., both drive new technologies and the application of innovative rod construction for the fishing rod industry as a whole. New rod materials and component development is usually a manufacturing derivative whereas the innovation of fishing rod construction continues to be developed from the small cadre of professional custom rod builders. This stated, rod builders in some form are all considered “hobbyists,” however our discussion will focus on custom fishing fishing rod building and the creation of rods crafted by professional rod builders, many of whom own and operate as small businesses, routinely producing finished performance custom fishing rods to the general public. Custom fishing rod building is done by rod builders who learned the “art” of fishing rod construction and have refined the process of engineering fishing rods from individual rod components. Though companies that do custom fishing rod building don't run industry-sized rod-making machines and normally do not fabricate the individual rod components, they do have an intimate knowledge of what “works” … and for “what reasons,” as well as what does not when it comes to building a custom fishing rod. More importantly, the custom rod builder is a “master” of ensuring those various rod components are configured in such a way to derive maximum performance from the finished fishing rod. 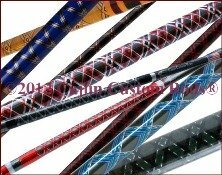 Custom fishing rod building focuses on sensitivity, durability, and action, power, comfort, and yes, aesthetics. They also have the “time” to build a fishing rod from start to finish (i.e., “right the first time”), and to truly build the fishing rod to attain maximum performance. Another important consideration of the custom rod-building company is that of technique or application specialization for the fishing rod. For instance, the custom rod builder is able to accurately meet the exacting technical specifications and requirements set forth by an angler whereas an OTS fishing rod is a “what you see is what you get” product. Quality and Custom Fishing Rod Building - Quality is by far the biggest difference between a custom fishing rod and an “off the shelf fishing rod.” A company that mass-produces fishing rods needs to create the largest profit margin on each rod possible and unfortunately, some (not all) manufacturers also cut corners on rod components … i.e., some shortcuts are necessary. Blanks and guides are not tested on each blank to determine the optimum positioning (nor can they mate a particular reel and line combination to them); instead, an average spacing is determined despite the fact that no two rods (even within a production run) are exactly the same. With custom fishing rod building a professional rod builder ensures each custom fishing rod is both static (for stress distribution) and dynamically (for best casting performance) tested. Smaller and fewer numbers of guides are often used on rods to save a few cents. A two-cent savings on each rod adds up over a production run. Others use components that may look like their name-brand counterparts, but are of considerably less quality. When it comes to a custom fishing rod, you will always know the exact components of your custom fishing rod because you select the rod components for the rod build. Additionally, a custom rod builder can assist you with your selection … again, an OTS rod builder only provides you what “they want you to have (seems backwards, huh? ).” Example: you go to dinner at a local restaurant and soon after sitting down at your assigned table, the waiter delivers your food … without asking your meal preference. Several advantages are offered by the use of quality fishing rod components and materials. First, through advanced technology, the corrosive and destructive properties of both fresh and saltwater no longer pose a viable threat to your custom-built fishing rod. Second, the use of more durable and scratch resistant materials will significantly extend the useful life of a fishing rod purchased from a custom rod builder, as well as ensure peak-performance. Handcrafted, custom made rods are tailored, designed, and custom-fit to meet the individual’s specific aesthetic, environmental, and fishing performance requirements. Because each custom fishing rod is built “one rod at a time,” quality control is ensured and certain to meet the unique criteria set forth by the angler. No two custom fishing rods are identical, but each one incorporates state-of-the-art fishing rod components and careful hand design that facilitates the ultimate angler fish-catching rod that is sure to be treasured for generations. Performance and Custom Fishing Rod Building - If you’re seeking better performance from your fishing rod, and ultimately, your overall fishing experience, then this is where a custom rod builder can really help you out. A fishing rod is tuned for performance in much the same way an automobile is tuned for driving comfort and performance … or the way a golf club is tuned to suit your personal style and physical size. Rod blank selection, rod length, guide selection, guide spacing, guide location, handle construction and reel seat choice are only a few of the factors that must be considered when designing and crafting a fishing rod made just for you, your quarry and your fishing style. 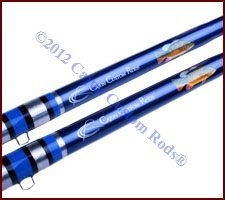 So does a custom made rod help you to catch more fish than an OTS rod? Absolutely. First, if you have confidence in you equipment then that confidence will be displayed in how you use them. If you know that your rod has been built right, that fact alone will give you an edge in your fishing. 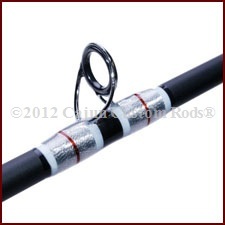 Further, when a rod is the product of custom fishing rod building it has been built properly, it will be optimized for your casting style, and the components will have been placed on the rod in such a way that you are will experience a far greater degree of accuracy as well as much better fish fighting ability. Once the fish are hooked, a well-built custom rod can provide tremendous advantages in fighting the fish and can help you control it better. This of course means fewer break offs and more landed fish! Not only will you catch more fish with a custom rod, your angling pleasure will certainly be heightened every moment you are on the water! Cost and Custom Fishing Rod Building - Now that you know that the core of custom fishing rod building is the unique selection, customization, design, quality, comfort, aesthetics, performance, and assembly of custom fishing rod components into a finished custom fishing rod, let’s discuss “cost.” A common myth is that a “more expensive fishing rod means a better fishing rod.” This statement is disproved with every custom fishing rod that an angler designs for a custom rod builder to build, at reasonable prices compared to similar competitors or the misleading quality of the mass produced “off-the-shelf-rod.” Custom fishing rod building provides competitive cost advantages because the custom rod builder is building each rod “one at a time,” rendering obsolete the need for exhaustive inventory, labor costs, and material waste. This permits excess capital for the use of top quality fishing rod components and materials. Additionally, custom builders routinely do not require capital investment and expenditure for overhead business expenses such as: advertising, showrooms, galleries, etc. Another advantage of “one at a time” rod builds is that high-end components equate to non-corrosive, scratch resistant, and a more durable final product thereby eliminating the need for reinforcing materials, additional assembly processes, and warranty repair. Any angler serious about catching fish and who routinely invests hard-earned money (entry fees, travel expenses, maintenance, tackle, equipment, etc.) cannot afford to purchase fishing rods that are anything but the best. After all, when you are on the water, executing everything within your power to fill the live well, then it is paramount to take advantage of any opportunity available (i.e., control what you can). So, it only makes sense to leverage the very best technology and craftsmanship for your primary fishing tool, your fishing rod. Rod Focus and Custom Rod Building - An advantage of not working at a large company, is that a custom rod builder is actually assembling and crafting your and only your custom fishing rod and they're doing so one rod at a time. So, in this example, focus does equate to quality of construction. Unlike the factory rod, a custom rod is built to accommodate your requirements and desires – your rod, your way. A custom fishing rod says many things about its owner. It marks the person as an angler who takes his or her sport seriously. It also says that one places quality and craftsmanship at the top of their list and appreciates the best. The custom fishing rod demonstrates not just pride of ownership for the individual angler, but more importantly pride of performance in their equipment. Freedom of Choice and Custom Rod building - In the game of fishing, sensitivity and confidence are the name of the game and that fishing rod is the instrument that provides both. When it comes to enhancing this sense, the only two things that have any effect on it is the line you're using and the rod you are holding. Ultimately rod choice is a personal decision, but knowing how to make selections can save you money even if you spend more on a rod than you originally planned. This is simply because if you don't get what will do the job right or don't get a quality product, you'll just have to make another purchase a lot sooner. The casual angler will probably get along just fine with production fishing rods. The more serious the angler becomes about the art of fishing, the more demanding and targeted his or her needs become in terms of equipment and performance. The serious angler will appreciate custom fishing rod building and the benefits of a custom crafted fishing rod for its optimum performance, targeted action for specific needs, superior construction, durability, and aesthetic appeal. 2. You get better rod components: a) that actually match, b) are more durable, c) are of premium construction (i.e., no short cuts), d) that add to the overall performance of the rod due to quality of construction, and e) compliment the aesthetics of the fishing rod. 3. You have “Freedom of Choice,” meaning: a) you have a better selection of rod components, and b) ultimately, the choice of components is yours, not someone else idea of the “perfect fishing rod for you. 4. Custom rods generally carry a warranty that is “what a warranty is meant to be”,satisfaction guaranteed without expiration or additional “fine print”. No up-front or back-end costs for those warranties that is so common for factory-made rods. 5. The custom fishing rod is custom-designed (by you) and handcrafted by an expert … not a machine. 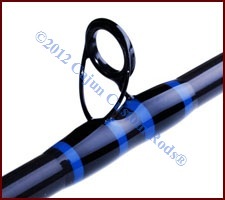 Your fishing rod is personalized, hand-tuned, custom-fit, and built one fishing rod at-a-time. Without a doubt, a custom fishing rod builder builds the finest hand-tailored custom fishing rods that are as unique as the anglers who fish them…. 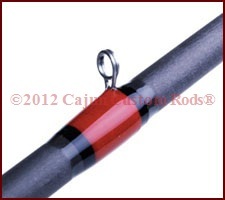 so the quality is through and through superior to any fishing rod that is manufactured. Times are hard and folks are working twice as hard for less money … so when it comes to spending a hard-earned dollar and folks having discretionary income to spend on a fishing rod … we’re here to make it worth their while and provide those folks with the peace of mind and confidence to trust their gear … building one performance fishing rod at a time.